Here in the United States it is difficult to think of the Historical Diving Society with- out thinking of Leslie Leaney. For twenty-five years ago it was Leslie who brought the Historical Diving Society into America from its original base in England. It is also true that while Leslie stepped down from the operations of HDSUSA a few years ago to devote his time fully to the elegant magazine “The Journal of Diving History,” if you listen closely, the heart of HDSUSA still beats to the rhythm of Leslie Leaney’s heart. It was different on October 18, 1992 when a small group of seasoned dive veterans assembled at the Santa Barbara City College Marine Technical Department for the inaugural meeting of HDSUSA. Present were Leslie Leaney, Bob Kirby, Bev Morgan, and Scrap Lundy, all were hard hat divers of the old school. In addition to Leslie the historian, the speakers were Bob Kirby, Bev Morgan, and Scrap Lundy, all seasoned commercial divers. Scuba historian Nick Icorn also displayed his expensive collection of equipment. With the support of the Kirby Morgan corporation and others the HDSU- SA was able to rapidly expand its membership internationally. Lee Selisky soon joined Leslie as Chairman and under the leadership of this partnership divers from almost 40 countries joined HDSUSA. Membership grew and the rest, as they say, is history. 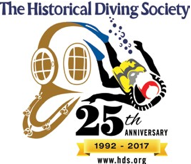 This year the Historical Diving Society celebrates its 25th Anniversary. There is a defining moment when an industry, especially a sport industry, is perceived to have the substance that makes its history worth telling and recording. That was and is Leslie Leaney’s ambition: to tell divings story from the moment primitive man stuck his head underwater to today. His was the insight and ambition that gave birth to the HDSUSA that we know today. The HDSUSA whose displays we visit at dive exhibitions and the magazine, well written and professional, that arrives in our mailbox throughout the year. Here at Beneath the Sea we have long been supporters of The HDSUSA. More than merely following their rise and illustrious career with interest, Beneath the Sea’s Founder, Armand Zigahn, encouraged them to bring their history to the Beneath the Sea exhibition for the diving community to see and touch. Thanks to their earned reputation for reliable reportage and their ability to attract better writers, photographers, and historians from throughout the international dive community, we have discovered many of the men and women we have honored at Beneath the Sea. Beneath the Sea is proud and privileged to recognize The Historical Diving Society USA and Leslie Leaney for twenty-five years of leadership looking backward at the courageous, dynamic, even heroic acts of the men and women who have by their courage, intu- ition, passion, and learning brought the dive industry into the twenty-first century.